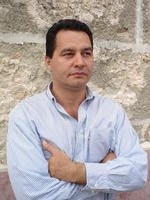 17 July 2015 — Ángel Santiesteban’s family just called me from Havana to report that a few minutes ago he was in contact by telephone and told them that his freedom is imminent. I don’t have more information at the moment. When there is more news it will be communicated through this blog. 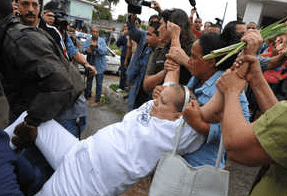 Angel Santiesteban attended the Ladies in White march today, 19 July 2015, just 36 hours after have been paroled from prison and despite warnings from officials from the political police. 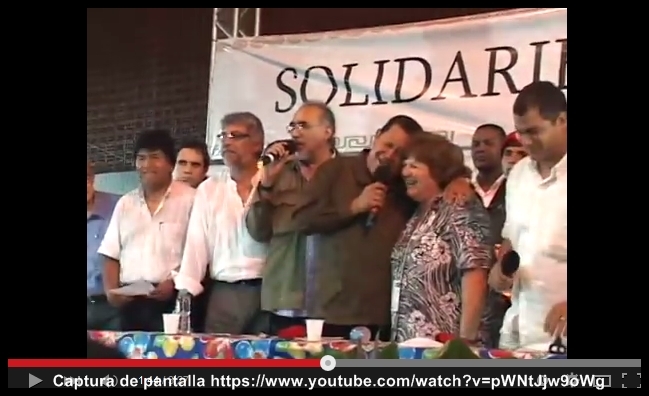 Barnet accompanied by Castro’s mobs in Panama City, Panama. We reproduce here an excellent article by Felix Viera about Miguel Barnet, president of UNEAC (Cuban Writers and Artists Union) and one of the most servile cultural commissar of Castro’s dictatorship. 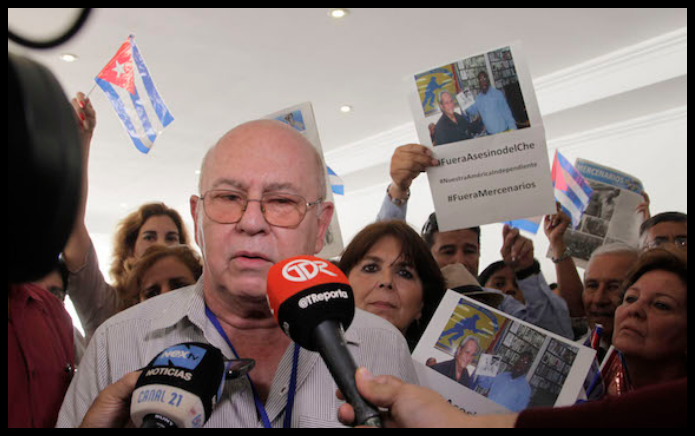 In the article Viera offers the example of what has happened to Angel Santiesteban. 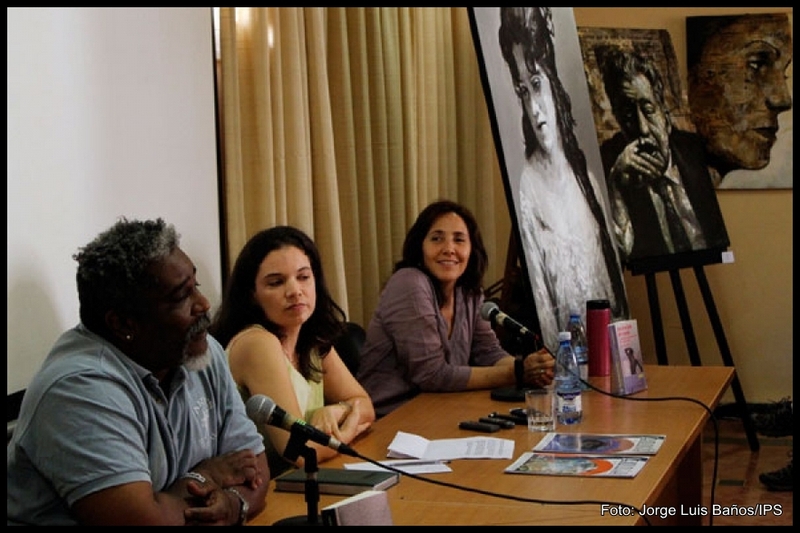 Miguel Barnet, president of Cuban Artists and Writers Union (UNEAC, ruling) chaired a meeting at the headquarters of this organization in the city of Pinar del Rio, reports Granma — official news paper — (like all the existing press in Cuba, paid by the government), in its issue of June 30th. Barnet, as he was candid instead of cynical, brought to the memory of those present, what he has called “Fidel’s words to the Intellectuals,” a terrible moment in the history of Cuban culture. Barnet knows it’s a lie. Lies. He’s a liar, an upstart. He knows, that Fidel Castro put together that meeting to put the screws on those who might think there would be freedom of expression in art and literature, if he didn’t, let’s remember: “Within the Revolution, everything, against the Revolution, nothing,” the most terrible maxim from Castro in the meeting. Which means, who is not with me, is against me. However, interestingly, the above phrase is not included by Miguel Barnet in his vibrant speech at the aforementioned assembly. It is not a lie, but it isn’t true either. Many writers received royalties, few, yes, by the publication of his work, but mostly for periodical publications. Writers then, in the Republic, had to perform two jobs, as in the Castro regime. A good question for the languid yet protean Barnet, would be: Tell me if UNEAC would agree to publish from the exiled writers any rebellious book about the Castro regime and sell it throughout the island, if we would pay for it? I am willing to pay and I know many others would do the same. But as we know, the answer is No. So, Miguelito, what advantages are we talking about? “Today we have so many figures, so many great artists who have never had the chance to develop, as happened from the words to the intellectuals, and the idea from the Commander of democratizing culture and stimulating the search for new talents in the most remote places of the country,” says Barnet in the above note. He lies. He knows he lies and he doesn’t even blink. He lies, he knew and his audience knew as well, but the island has already become a place where to lie in favor of the Castro regime is a tacit agreement among those who speak and those who listen. Bilge water. I think this is a good question for Barnet: Isn’t there a huge group of artists, intellectuals, artists in general who live abroad, because there they could not, they cannot express themselves freely? Isn’t there within the island punished, censored or imprisoned intellectuals, for publishing the truth about “politics,” as is the case with Angel Santiesteban? Is there a future in Cuba for a young artist who attempts to break the rules of the dictatorship regarding what should not be in a play? We see every day how Miguel Barnet drags himself down more. And one of his fine moments is “to rumple the Commander’s beard” whenever he has a microphone in hand. Many disdain you, because they know that you do know that what you say is false; you’re made of a different wood and thus result in a lousy actor. You’ll see it, you’ll see the day when the bells ring the alarm. You see. That’s how things are going. Ángel Santiesteban-Prats, 13 April 2015 — A friend’s grandmother claimed that most people complain,”When their own toe is stepped on, but not for someone else’s” because it does not hurt them. Just a few days ago I wrote a post in which I mentioned the Cuban intellectual Victor Fowler. 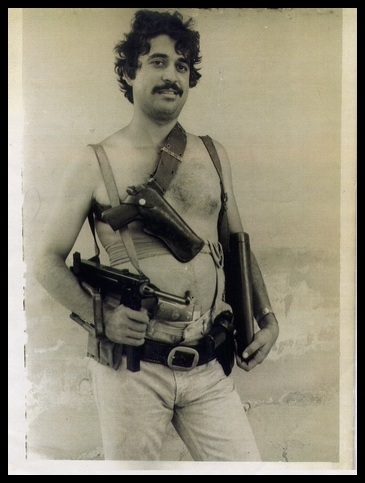 Despite having explained the real dilemma for which State Security threatened to imprison me — and he listened to me and at least said he recognized my situation at that time — I offered him a ride in my car, when I saw him on the street taking his son to José Martí National Library for a cultural workshop. At that moment he made me believe that he empathized with my case. I swear if he had disagreed with me, I wouldn’t have put them the car, on the contrary, I would have admired him. 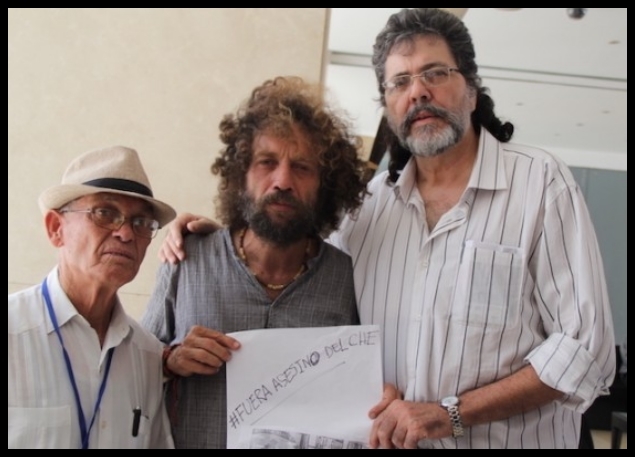 The truth is, that after he stepped out of the car, he gave his signature to those ladies from UNEAC, the Cuban Writers and Artists Union. 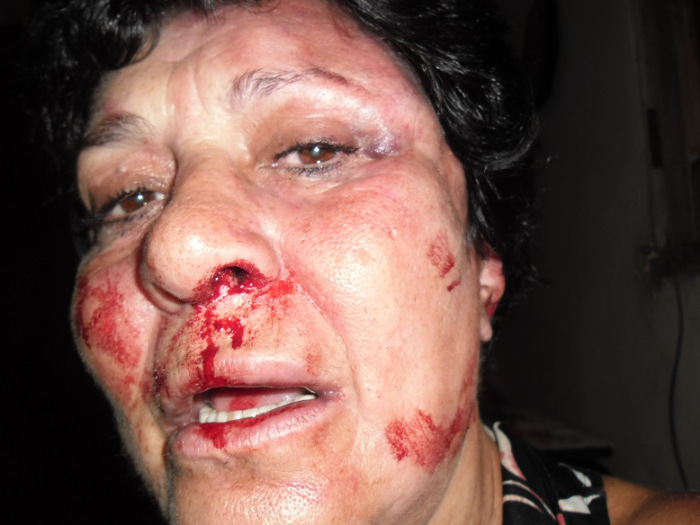 And then he did not sign when actress Ana Luisa Rubio was beaten outside her house because of her dissident attitude. A serious inconsistency for some who claims he has been humiliated by a building guard who would not let him in, he said, because of the color of his skin, and tries to make a national scandal out of it. Of course, I declare myself totally opposed to any discriminatory act by race, sexual orientation, religion, origin, cultural or political views. I am opposed to any abuse like the one committed against the Ladies in White and government opponents throughout the island. You stand up against every injustice or none, above any personal cause. I found myself in precisely that place after winning the national UNEAC award for the genre of story and — the theme of my book being based on the Angolan war — Abel Prieto begged me to make a deal and remove five stories considered very critical from my book. “In my mandate I have not censured anyone,” he told me. Therefore, that call was not censorship, because he offered me an apartment for making the deal, which I finally did after reminding him of his phrase against Fowler, fearing he would do the same to me. He threw his arm around my shoulders, saying, “politics”in the end, and laughing he assured me that he would not do it again, a way to recognize his negative and humiliating attitude. Maybe, Victor Fowler may not need my wholehearted support, but — besides doing it for him — I do it for a personal need. For taking such positions, I find myself behind bars today. 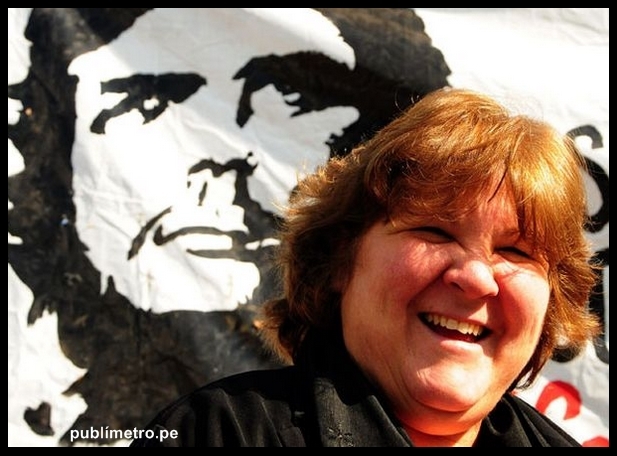 Ángel Santiesteban-Prats, 13 April 2015 — My colleague and friend Felix Luis Viera has written a post about one of the most disgusting human being I’ve ever had in front of me: Aleida Guevara. Sometimes we ran into each other in our children’s school on 62nd and 5th Avenue, in the Playa municipality. 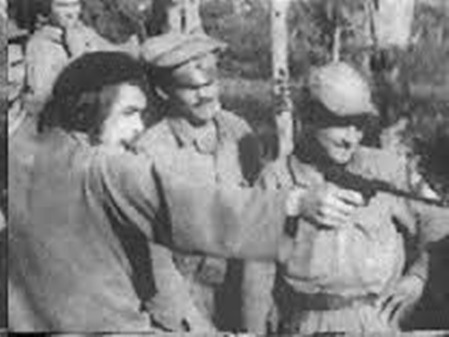 I talked about it once in a post — I also described that facts I am giving you now — when a teacher told me that “Guevara”, as they call her, had been inquiring about my relative. Fortunately, he is out of her reach and her revenge. On that occasion I commented on the arrogance, pushiness and haughtiness which she displayed and with which she manipulated those around her. In fact, she acted like the school principal, while the actual principal along with teachers nodded their heads in constant assent, fearful of a complaint from that fatso with “commander pretensions,” regardless of the cause and reason, which could get them expelled from the school in the blink of an eye. This woman, as brute as a mule, moved around that institution like a triumphant guerrilla. I cannot forget, it still disturbs me when it crosses my mind, that later this “hairless bearded-one,”* living in Cuba for forty years, had the mission of visiting Argentina, and when she returned Fidel Castro received her at the airport terminal. It was broadcast as an official event, and the reading of her horrendous speech with a lousy Argentinian accent was the talk of the town. 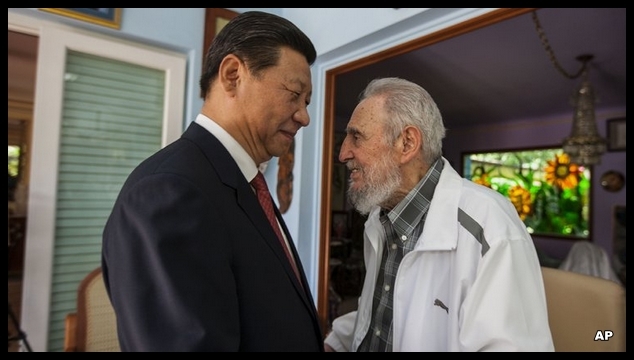 Fidel Castro could not hide the discomfort in his face that such a repulsive human being caused him. I remember a friend who told me that, “There are people who are not satisfied with being stupid, but they make sure everyone knows about it.” Bragging of being the daughter of a murderer — who signed hundreds of executions by firing squads without fair trials — is only acceptable for a shameless and intellectually weak person; but for others to applaud her in public, it is a mistake that some will live with for ever. 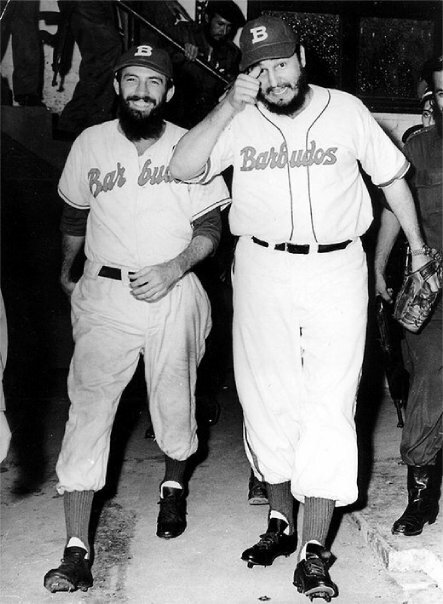 Camilo Cienfuegos and Fidel Castro after the Revolution, proudly wearing their moniker on both their chins and their uniforms. 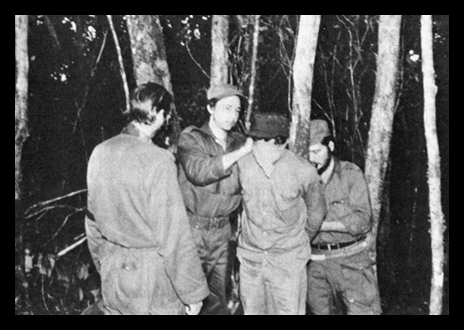 Raul Castro blindfolds a guerrilla sentenced to die by firing squad. Ángel Santiesteban-Prats, 14 May 2015 — I pray that Europe does not expose its neck to the dictatorship — especially to Raul Castro “the vampire” — who, by tradition, for over fifty years, has sucked in as many opportunities as his long, sharp fangs have allowed him to. Each time the dissolution of the (EU) Common Position which prevented the dictatorship to continue abusing opposition as it wanted gets closer, and now, like a snake, we see the dictatorship crawl to its new convenient position that will strengthen it, in order to stay in power and continuing through the “heirs” of Castro being the absolute masters of Cuba. Arrogant as usual, Raul Castro appears before foreign presidents — who so far have kept a common front to halt his Human Rights violations — and tries to change the story, as if telling a lie over and over in any stand he is offered would make them believe him. 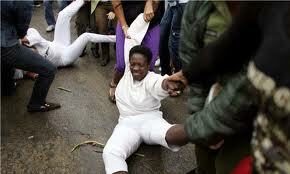 “Cuba is innocent, it should never be on the list of terrorist countries. When terrorists are those who have committed the murders?” he said recently, meaning, that any guerrilla and separatist movements they prepared and armed is not terrorism. Besides that, he just shouted that negotiations with the United States must be slow; “He bought fish and he got scared of its eyes,” like we say in Cuba. It’s like dealing with madmen, who are incapable of providing minimal coherence. 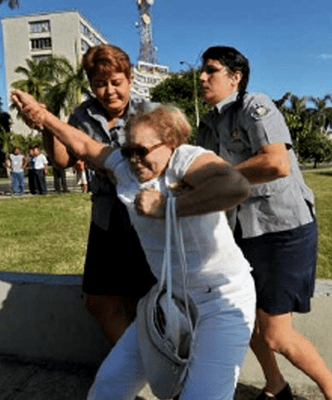 The Castros need to show that they lead the talks and they are not the eager ones, and do tricks as if it were an ordinary card game, where you pretend to have the trio of Aces. 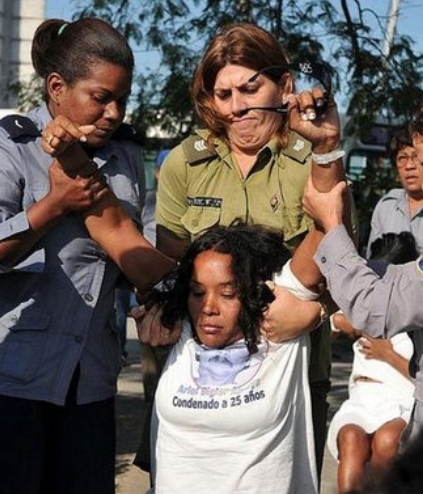 While there are no signs of change and respect for human rights, it is a mistake to strengthen Cuba’s dictatorship. Unfortunately, I do not visualize that positive mood in the intentions of the totalitarian regime — that with no choice left — we will have to continue facing it for the rest of our abused lives. 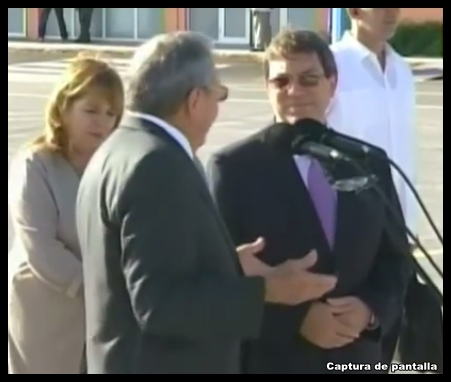 Ángel Santiesteban-Prats, 13 May 2015 — Again Raul Castro lies to the world when he says on television that “independent journalists” are graduates from a course at the United States Interest Section (USIS) in Havana, and that they also receive a “stipend” from that agency. Graduates from that course: I have met lawyers, doctors, economists, among many professionals. I remember at some point I was interested in that course, but I never completed my registration. It was not a bad idea. Knowledge is always welcome. However, when the dictator on duty mentioned the independent journalists, he let slip the characteristic cynicism that shows on his face the “bird of prey” that he is. The tyrant is unable to recognize that it is not exactly a “stipend” we are entitled to, but a “beating” his henchmen launch against those who have decided to think differently, those step off the track and exercise journalism and free thinking, which is not taught nor learned at any foreign Embassy or US Interests Section. It is what lies within ourselves and comes out when we need to be honest to ourselves and we are pleased with the mere fact that the price for that sacrifice it is “whatever it takes”. And that does not make us brave or heroes, it just give us a faint smile and great joy in our souls. Hopefully their “official journalists” at least feel useful instead of just “informative echoes” of the ideological office of the Central Committee of the Communist Party. Yes, INDEPENDENT JOURNALIST and very proud; and although you don’t want to recognize that we keep you awake, we know what our duty is and what words and whose would offend us. Coming from you, your contempt is not considered an offense, we take it as a recognition instead, for the job of being the voice of the oppressed, of those who suffer under your Stalinist boot, and it encourages us to do it better and maintain the resounding conviction, “You cannot cover the sun with your finger’” nor even with jail nor with blood. There is not a single day of my existence in prison in which I don’t feel embarrassed for those women who, at the beginning of 2013, once I was jailed, made a supposed appeal against gender violence, when in fact it was later shown — by the silence they maintained before other forms of violence exercises against women in opposition to the regime on the island — that they were just intending to comply with government oder, dictated by Abel Prieto personally, spokesman and sinister mastermind, from the darkness of his office as advisor of Raul Castro, the main purpose of which was to smother international solidarity in my favor. At that time, those women, especially the intellectual ones — whom I had travel with, shared book presentations, events in which they devoted odes to my affability; who I shared emails with daily, dinners, who organized surprise parties for me, and appeared with me in national and international anthologies — once they received the official order, the joined efforts to execute me publicly, just to receive the attention of politicians and cultural officials and looking not to be forgotten when trips abroad are awarded, with which the dictatorship usually rewards their most loyal subjects in the culture field. I knew some of them well, very well, and I know for a fact what they really think about the government. I also know — backed up by witnesses — that those pretending to be more pro-government, forced to do so by paternal inheritance, have a discourse in the shadow, I mean when they don’t feel spied upon, even more aggressive than the discourse of many who are today in the opposition. Since survival in Cuba depends on faking it instead of being who you really are, people keep faking their delight like tender sheep that bleat praising the power of the totalitarian regime. At that time, when they were ordered “to execute me” publicly, I did not defend myself. On the contrary, I supported their gender struggle and, as many may recall, I asked them to include in their demand to halt the public beatings of the Ladies in White who, in those days and still today, keep being abused by troops of women and men from the military wearing plainclothes. If their demand was that honest, if their intentions were that noble and their feelings against violence were that profound, it should hurt them the same for any woman, regardless of her geographical region, the color of her skin and her political views. Silence instead was the clearest of their answers: confirmation of their double standards and their foul play. Their gender struggle is just fashion, a political attitude of convenience, or a more opportunistic way to earn their cultural spaces. Nonetheless, I refused to believe such a lack of solidarity. I was shocked, nor did I conceive that someone could advocate for women, putting all their criticism upon a disident like me (who, by the way, it was shown shortly after that the accusation was a hoax, and so far they have not apologized), leaving aside any abuse, whether it is domestic violence (which unfortunately occurs in Cuban homes often), or people who follow government orders (like those beatings that occur all over the island, in front of society as a witness and in front of independent and foreign media, that capture the facts and support international complaints that these “worthy women” keep disowning even today). 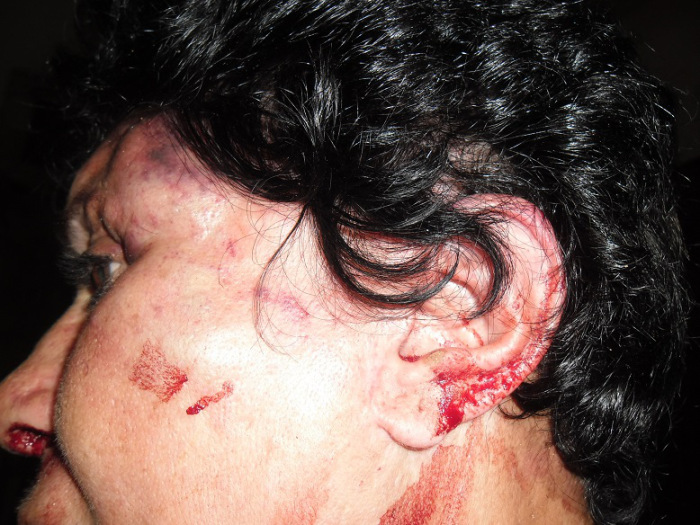 When they savagely beat actress Ana Luisa Rubio, who was an icon of Cuban television, I appealed to the decency of those “righteous” women from UNEAC (Cuban Writers and Artists Union), who signers of every official call presented to them, and begged, I pleaded, for them to raise their voices in the Cuban cultural spectrum, to stand up for the civil rights of this colleague, to whom we owed solidarity and commitment as artists. Silence was once again their answer. Through national media, the so-called Intranet, painful pictures were exhibited in which Ana Luisa Rubio, the beautiful actress, appeared unrecognizable after a gang from the Committees for the Defense of the Revolution (CDRs) provoked her, got her to leave her home and attacked her and dragged her down the street until she was unconscious. However, not even when those images went all around the free world through the internet, which some of them have access to, none of these “righteous” women stood up to condemn such vandalism against a comrade. 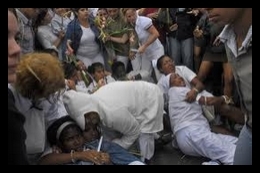 Recently, two Ladies in White were stabbed on the street in public, while trying to keep opposition leader Guillermo Fariñas from being murdered. Their lives were in danger, especially Percibal Maria Arango’s, who was in intensive care at Santa Clara hospital. Her attacker, Jose Alberto Botell, who besides these two women, stabbed three men who accompanied them, rather than a conviction, Botell received four years in prison — as a prize — because their victims are (political) opponents. Lady Writers and Intellectuals from UNEAC: Regardless of the personal interest that you have in hiding this inconvenient truth, you cannot deny that the government you “support” is one of nepotism, a sponsor and partner in gender abuse. That is why I know you only say you defend a government like that — nowadays, honestly, and knowing most of you like I do, I doubt it. It is clear to me that it is all about opportunistic positions. 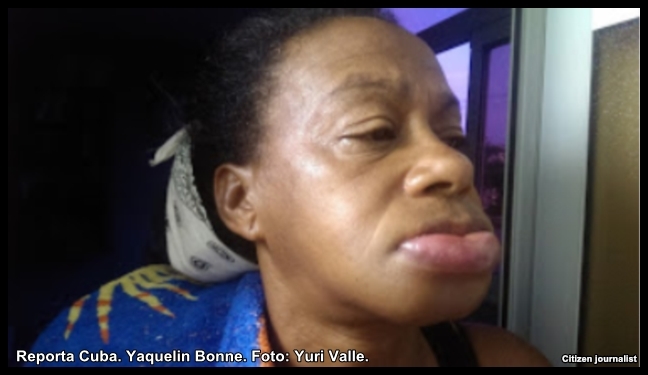 If they wanted to clear their consciences, they would denounce what happened a few days ago, on Sunday, May 31st, when a woman, mother, black, middle-aged and a patriot, Yaquelin Bonne, was brutally abused, as shouldn’t be allowed to happen even against the fiercest animal. International media have been busy spreading the word with the terrible pictures of the brutality committed against this woman, whose only “crime” is to be an activist for the human rights of all Cubans from the platform of the Ladies in White, worthy Cuban women whose unique weaponry, which they have shown well, is to march every Sunday in front of the church of Santa Rita, after Mass. Hopefully some of you have the courage, even, to show up on Sunday in front of that Church, and see with your own eyes the most horrible manifestation of the gender violence that you claim to fight against. If you realize, the only thing that will prevent you from being beside those worthy Ladies in White will be your continuing to live in fear or the convenience to an official order. I doubt as intelligent as you are — because I am a witness of such intelligence — that you believe that these women, because of difference in political views, have no right to be defended. In the silence of all of your lies the biggest and meanest is the defense of machismo, complicity with the horror of gender abuse. With each humiliated or abused woman you keep a timely silence and you lose a new opportunity before history to show real commitment to your positions as intellectuals; before your time, the docile silence, but above all, before your own gender, as women, for being accomplices and taking part in a state that does not stop the outrage against those women who defy their directives. God forbid, at least this time, do not allow yourselves to be manipulated by the fear to a totalitarian power. After the Congress of Honduras, according to the validity of its statutes, decided to impeach former president Manuel Zelaya, the mafia of leftist Latin American presidents have attacked from all sides the new elected government of Porfirio Lobo, expressing their support for former president Zelaya, who took his dismissal as a coup. The late Hugo Chavez was the one who led the crusade in his favor. Since that historic event, the “wound has not healed” and, once the new president has committed to give continuity to Democracy in his nation — Democracy which was reaffirmed during last presidential election when Hondurans did not gave their vote to Xiomara Castro de Zelaya, the former president’s wife, and elected instead the agricultural entrepreneur Porfirio Lobo — these pro-Castro governments have joined efforts to plot and make it difficult the advancement of his plans for social, political and economic development. They have done the same thing against Paraguay and, more subtly, against Costa Rica, Peru, Panama, Colombia and Chile. Even though some of these governments voice a leftist speech, they do not align with such extreme attitude as of the aforementioned mafia, who do share their strategies from an ideological model established by Cuba, the most trenchant one being the use of doctors, technicians and personnel from several professions who are sent to “international missions” to “irrigate” among the impoverished classes, “like seeds are irrigated on a fertile field,” the populist harangue, proposing to them a supposedly suitable mold for their specific needs, with no warning whatsoever that it is a failed formula, which has plunged into an absolute poverty and chaos both Cuba and Venezuela. Nor they are told that in these countries, when government has no choice but to face their own failures, they cling to an archaic historical excuse, but one that is still effective to deceive the unwary: blaming the government of the United States for the disaster. This extreme leftist wing has used and keeps using their public platforms to attack previous and current US administrations, exposing a visceral hatred based on false populist speeches, but they do not use those same platforms as they should, to advocate for people’s freedom, especially to ensure people their right to dissent against governments, their right to criticize and express such criticism publicly, but also, above all, to create better economic opportunities to alleviate poverty, to ensure an effective fight against drug trafficking and crime in general. 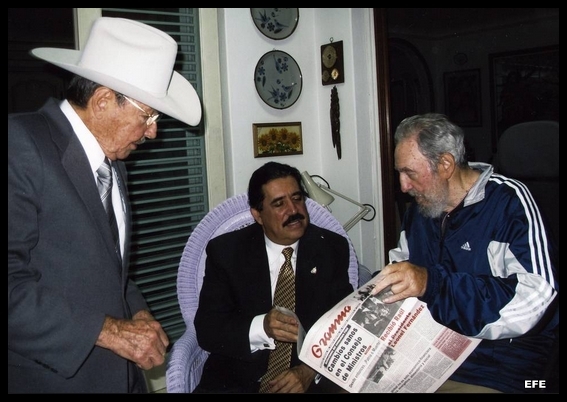 Times today, fortunately, thanks to development in the fields like communications, do not allow the truth to be hidden anymore, as it happened in Cuba for decades. And even though those governments want to keep the wall up and strengthened, it is impossible to do so, and news transgresses the media silence of dictators. I congratulate the Panamanian president, Juan Carlos Varela for the opportunity offered to Cuban dissidents to express and explain with dignity, especially to the rest of Latin America that still believes in justice, the abuses and outrages that the regime practices daily in the Cuban archipelago against those who defend the right to think differently. Thank you from my cell that has seen the light and the splendor of freedom. 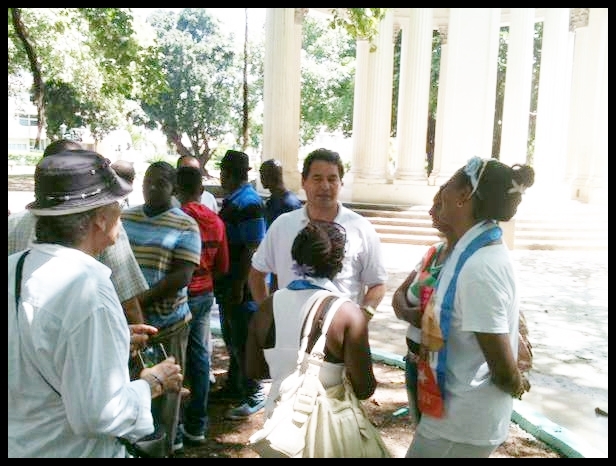 Angel Santiesteban-Prats, 14 May 2015 — Like in an old historical museum of the horror of the Cuban Revolution, the visit of the most powerful rulers to Fidel Castro’s lair is expected. It’s like visiting a living mummy, still able to continue to do harm to those who do not coincide with his directives. They have chosen the photographs instead, because they are ashamed of the grimaces and gestures — that come along age — to be seen by the rest of the world. For some presidents who visit the Cuban archipelago, leaving without a snapshot alongside the old wolf it is like going to Paris and not being photographed at the Eiffel Tower. I understand that in politics and to any human being in general, being photographed with the old jackal means a moral disgrace. I would not portray myself beside Hitler or Stalin nor even next to their wax replicas. Times of dignity are scarce. Some call it diplomacy, however talking on the phone with Antonio Rodiles, we agree that subject is about telling the truth in a decent and settled way. It is pitiful that suddenly, in an incoherent attitude, the presidents of the European Union behave so far from what they expressed in their speeches at the opening of Cuba-US talks with the United States. I do not think that negotiations with Washington and the European Union materialize, provided that they are willing to “drop their pants and being spanked” by Raul Castro, because any agreement that includes Democracy, meaning, multiple parties, human rights, free and direct elections, and the departure of Castro from power — simple needs of 21st century –Raul will not accept. Anyway, old communist wolves will draw something out of this political match, especially now that the Venezuelan economy is in chaos and continues its free fall. Therefore they have rowed alongside Russians and Chinese, because if Cuba-US negotiations should not work, as it seems, they will have to take advantage of someone in order to survive, which is already a custom of the Castro tribe. I remember that phrase from childhood when things seemed dull: “Every man for himself.” We will say the same words when the dictatorship’s tantrum begins. Meanwhile, tickets and showtimes remain the same at the exhibition of the “red mummy”.